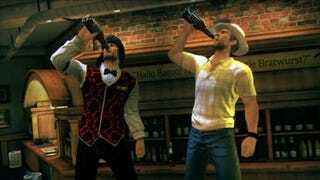 Two Chucks are better than one in Dead Rising 2. When the zombie-packed Capcom action game hits the Playstation 3 and Xbox 360 in August, it will allow gamers to play through its story as a duo of the game's lead: Chuck Greene. While both Chuck Greenes will be able to keep all of the spoils of their anti-zombie rampages and earn experience towards leveling up, only the Chuck Greene who hosts the online play-through will be able to save the game's progress. The game won't, developer Blue Castle Games told Kotaku, allow two players to play with one another on a single console and television. I had a chance to take the newly unveiled cooperative play of Dead Rising 2 for a spin last week. To bring a friend into the game with them, a player has to press right on the direction pad of the controller and send out an invite. Once your friend accepts the invitation a little icon showing a two-way radio pops up in the bottom corner of the screen and you can allow the player to drop in. When I tried this, the game went to a load screen for about a minute, and then popped me back into the game exactly where I was with another Chuck by my side. While both Greenes would normally look identical, the myriad of wearable props and outfits mean that they're typically going to be pretty easy to tell apart. In the case of my session, one Greene was wearing an ill-fitting blue and green super hero costume and Groucho glasses while the other was wearing a white and rhinestone Elvis jumpsuit. Faced with a second Greene and a fellow gamer controlling him, we immediately ran out from the back hallways of the casino we were in to see what sort of mayhem we could get up to. While we were able to stand shoulder-to-shoulder and cut through the hordes of zombies, what we couldn't do, I soon realized, was team up to deliver special two-man attacks or use special two-person weapons. It was a little disappointing to realize we couldn't, for instance, grab both ends of a zombie and pull or build some sort of uber-weapon that required four sets of hands. Another disappointment was coming across a wheelchair and realizing that Greene number one couldn't sit in it while Greene number two tooled it around the casino. I cornered a developer at the event and asked him about that lack of coop play support. He said that the team has heard an awful lot about the lack of wheelchair drive-bys and it was something they were looking into. Fingers crossed. What we did discover, though, was how fun it is to create your own games inside a zombie-packed casino. After failing to load a Greene into a wheelchair, my gaming buddy and I decided to round up two wheelchairs and have a race around the giant oval of the casino. This turned out to be a lot more fun than we expected. Standing behind a chair, you can get Greene to hold onto it and when he pushes the chair, he does so at a run. Because the controls are deliberately sloppy, the race was the perfect mix of skill and luck. We even managed to knock into each other as we raced, forcing the wheelchair pushing Greenes into walls of zombies and slot machines. The race completed ( I lost after being knocked into another toppled wheelchair), we looked around for other games to play. Next up was spot the zombie. I found two cans of spray paint and colored a zombie red and green and then challenged the other Greene to find the zombie. It would have worked, but the paint disappeared in less than a minute. Next, Greene number one climbed up on top of a tower of slot machines with a machine gun and I found another zombie, this time slapping a Blanka mask onto its head. This worked a bit better, but anytime the zombie hit a wall or machine the mask popped off. The developers said the disappearing paint would likely remain that way, but that the masks were a bug they were working on. Spot the Zombie confirmed! I noticed, while playing around with the other Greene in the casino, that when we were separated a tiny animated Greene popped up in the bottom corner of my screen. The little Greene showed in real time what the buddy Greene was up to. It even showed the weapon he was wielding at the time. What it didn't show, though, were his surroundings or enemies he was attacking. So what you were left with was this strange little pantomime going on in the bottom corner of your screen. When other Greene was attacked, the tiny version of him on my screen would react as if being bitten by invisible zombies. That gave me an idea. What if, I asked the developers, you could press a button to make your Greene go through the motions of being attacked even if he wasn't? The idea, I explained, would be that you could fake an attack and then when your buddy came running to your rescue, smack him in the head with a golf club or mannequin leg. Great fun! They seemed amused, but I don't see it coming to the game. I tried faking an attack myself, spinning my Greene around as if he was surrounded and calling out to my buddy for help. He didn't buy it. That's probably because once you are attacked and taken down by a zombie your buddy can revive you in the cooperative game. The fallen Greene automatically calls out for help and a bar pops up showing his draining life as he lays on the ground. To revive the dying Greene, the healthy Greene has to find some food and bring it over to him. While I love the concept of cooping through Dead Rising 2 with a friend, the experience still needs a bit of work. How, for instance, will I convince anyone to come play with me if they know I'm the only one who gets the campaign save point? And why two Greene's and not some second character? Also, I'd love to see at least one new weapon or tag-team attack added. There's a bit of time still, the game doesn't hit the PC, PS3 and Xbox 360 until Aug. 31, so maybe some of those issues will be addressed. Until they are, I suspect most people will use this not to work through the story, but to run around being zombie-killing idiots, which is OK too.